Charlie resigned from the Navy in June, 1941 to volunteer for the AVG. He was placed in charge of the largest group of AVG (125) which sailed aboard the Dutch ship Jaegersfontaine from San Francisco for Rangoon on July 10, 1941. Upon arrival at Kyedaw Airfield, Toungoo, Burma he as assigned duties as Acting Group Adjutant and in this capacity assisted in the organization and assignment of personnel of the Group. 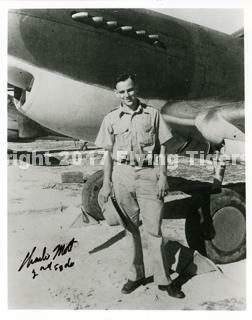 He was designated a Flight Leader and operations officer of the 2nd Squadron. Charlie was relieved of Adjutant duties in Mid-September. When the optical gunsights did not function, he took on the task of adapting and redesigning them resulting in a gunsight superior to the old “ring and ball” sights. After the 2nd Squadron was deployed to Rangoon in late December, ’41, he flew experimental but ineffective missions against night attacks because close radar control was not available. The AVG then seized the initiative by attacking Japanese airfields in Thailand. While leading an attack on the airfield at Mesoht, Thailand, he was shot down by ground fire and captured, severely wounded. He was the first allied pilot to be captured in Asia. The Japanese let him recuperate from his wounds and tropical fevers and in July, 1942 put him in with British troops captured at Singapore. For three years he experienced the conditions in POW camps along the River Kwai railway and was repatriated at the end of the war. He is now the sole survivor of the four AVG pilots captured. Upon returning to the States, he was recommissioned into the regular Navy and completed a Naval Aviator career of Lt. through Captain, specializing in ordnance and guided missiles. He retired from the Navy in 1963. His Navy career included command of a four-engine squadron and operations officer of an attack carrier. He was the planning officer in the 7th Fleet, responsible for the joint China (Taiwan) resupply Quemoy during the 1958 incident and was honored by the Chinese with the Cloud and Banner Medal. In his last job he was responsible for the production of all U.S. Navy tactical guided missiles, torpedoes, mines, rockets and miscellaneous ammunition and expendable ordnance including electronic gear. Subsequently, he worked for years for a “think tank” (ANSER) under contract with the air staff of the U.S. Air Force in ordnance/missiles matters and in defining such aircraft as the F-15, F-22 and A-10. He married Ellen Mary Hooge of Mobile, Alabama and had three children. Upon her death, he remarried to Helen Michaels of Ojai, CA and is dividing his time between Ojai and Vienna, VA.